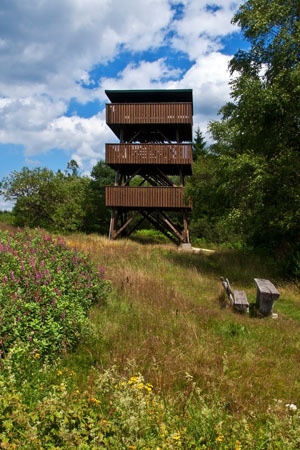 If you climb the observation tower on the Erbeskopf on a mild summer evening, deeply breathe in the mountain air, slowly relax, and take in the view of the endless hills, knolls, plateaus, and valleys, you will inevitably feel something of the special lure of the old cultural landscape of Hunsrück, which has been preserved after thousands of years of evolution. Smoke rising in the distance reminds you of the people in the region, who have fought for their existence here since time immemorial. People who have had to deal with war, senseless destruction, and foreign rule again and again is something that is very hard to imagine in this peaceful landscape. Luckily, the cold war of the last century is long past, for which the extensive military installations on the top of Erbeskopf were intended. These can now rightfully lie peacefully dormant. Incidentally, it does not have to be a mild summer evening for the unique Hunsrück atmosphere here on Erbeskopf to work its magic on you. Try it on a day when it is not so beautiful. When, for example, the autumn storms rush over the land and dense clouds block your view. When wisps of fog are blown in again and again, making people and the surrounding nature almost invisible. Alternatively, go in the last days of October, when the cold wetness chills you and the rain interspersed with snowflakes heralds the definitive end of autumn. Be there in the spring when the valleys are already in full bloom, even though the last remains of snow brazenly persist here. There are many opportunities for a trip to Erbeskopf, including in winter. For the area around Erbeskopf is a popular ski resort where enthusiastic skiers arrive as soon as enough snow has fallen. The winter sports centre on Erbeskopf offers three downhill runs that are served by four ski lifts. There is also a fast toboggan run as well as a ski school. Altogether there are 40 km of trails at the disposal of cross country fans, trails that lead to the winter sport centre on Idarkopf. The woods around Erbeskopf are among the most beautiful and most primeval in the entire Hunsrück region. So how would you like to take a small circular tour in the area as an initial exploration? It is best to start at the observation tower on top of Erbeskopf, stopping at the picnic area for a proper breakfast of fresh bread, cheese and coffee. Strengthened by this, the pathway first leads to the crest of the mountain ridge of Hochwald, westwards over Springenkopf (784 m) to Viehauskopf (721 m) and from there down into the valley to a mountain spring named after Siegfried, one of the Nibelungen heroes (Siegfried-Quelle). This idyllic and very secret spring is actually a well, contained in stone. After a suitable rest you can continue through the deep forest to the hamlet of Thranenweiher, where you will encounter the Nibelungen legend once again. Here, according to local tradition, after Siegfried's murder by the grim Hagen von Tronje, the beautiful Krimhild, shed a never-ending stream of bitter tears.